The New York Empire presented by Citi announced today the themes for each of its seven home matches during the 2018 season at the USTA Billie Jean King National Tennis Center in Flushing Meadows, N.Y. Featuring live entertainment, games, food trucks and face painting, the team will welcome guests of all ages as top-ranked American John Isner takes the court against the Washington Kastles on opening night, July 15, for Family Fun Night. Festivities will begin at 3:30 and the action on the court will be served at 5:00 that evening. On Wednesday, July 18, the New York Empire will honor women who inspire today’s youth as Billie Jean King and the Women’s Sports Foundation participate in Empower Her night when the Empire host the Philadelphia Freedoms. Hundreds of young girls will be treated to one of two tennis clinics sponsored by Empire BlueCross BlueShield or the Women’s Sports Foundation as part of Empower Her night. Participants in both clinics will receive a complimentary racquet, interact with the New York Empire roster, take a photo with Billie Jean King and Head Coach Gigi Fernandez will also make appearances. A special ceremony will take place at halftime to recognize those in attendance. The New York Empire will Play for Puerto Rico on Friday, July 20 against the San Diego Aviators. Head Coach Gigi Fernandez will be raising funds and awareness for her native Puerto Rico after the devastation caused by Hurricane Maria last September. A special, live auction will take place at halftime featuring a bidding opportunity to play in Arthur Ashe Stadium for one hour later this summer. Mardy Fish, former American No. 1, will take Court 17 on Monday, July 23 when the Washington Kastles make their second visit to the National Tennis Center as the New York Empire host Unity in the Community Night. The night will feature a salute to military service members, veterans, and first responders. Any tennis fan who attends in uniform or shows their military or service identification card will receive complimentary admission to the night’s match. On Wednesday, July 25, the New York Empire will celebrate and showcase the multi-cultural fabric of Queens on International Night. Live music, international cuisine, and special, on-court performances will highlight the evening. The Orange County Breakers come to Court 17 on Thursday, July 26 when Genie Bouchard and Fish will help host Volleys Against Violence. High school students are encouraged to rally together and join the evening that will feature a pre-match pizza party with local police officers and on-court contests. Tickets for the evening cost just $10 for students. The New York Empire will close out its season on Thursday, August 2 against the Philadelphia Freedoms with Fan Appreciation Night. Promotional giveaways will be featured throughout the evening and the first 500 guests will receive a special gift. One lucky fan will win a raffle for 2019 New York Empire season tickets. Tickets start as low as $10 for children ages 16-and-under and $25 for adults. The New York Empire offers both reserved box seats and general admission seating, along with hospitality packages, which include food and beverage service and the opportunity to meet the team. The unique experience is an evening featuring specialty food, music and non-stop action on Court 17. Group tickets and various hospitality packages are available by calling the New York Empire office at 844-5-EMPIRE (844-536-7473) or by visiting www.nyempiretennis.com. New York Empire tickets can be purchased by visiting Ticketmaster or by calling the New York Empire office at 844-5-EMPIRE (844-536-7473). The 2018 WTT regular season will take place from July 15 – August 2 with the No. 1-seeded team hosting the championship match for the King Trophy on August 5. For more information on World TeamTennis, visit www.WTT.com. Follow the New York Empire on Instagram and Twitter, and like us on Facebook. 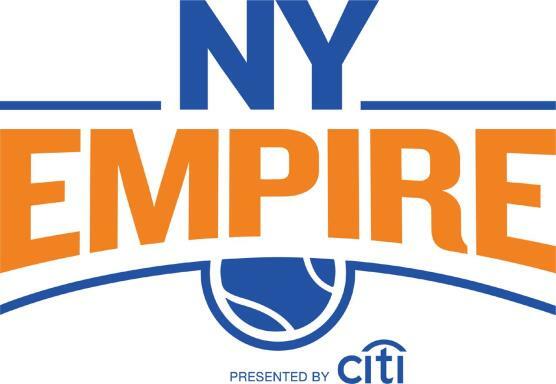 The New York Empire presented by Citi is one of six teams competing in World TeamTennis. The New York Empire will play their home matches on Court 17 at the USTA Billie Jean King National Tennis Center in Flushing Meadows, N.Y. between July 15 – August 2. WTT is in its 43rd season as the innovative leader in professional team tennis competition. Team matches consist of five sets, with one set each of men’s and women’s singles, men’s and women’s doubles, and mixed doubles. One point is awarded for each game won and overall match scoring is cumulative. The Presenting Sponsor of the New York Empire is Citi and GEICO serves as the team’s Platinum Sponsor. Official Sponsors include Empire BlueCross BlueShield, Bloomberg, Deborah Slaner Larkin, EY, NYU Langone Health and USTA Eastern. Gold Sponsors are Brightstar Capital Partners, Celebrity Screens, Franklin Templeton Investments/Fiduciary Trust Company International, LaGuardia Plaza Hotel, SNY, Teneo, Tennis Magazine, Trans-Star Executive and Voss Water while Patron Sponsors include Brooklyn Brewery, Long Island/New York Tennis Magazine, NY Lifestyle Magazine/Blue Vista and USTA New England. World TeamTennis (WTT) showcases the best in professional tennis with the innovative team format co-founded by Billie Jean King in the 1970s. Recognized as the leader in professional team tennis competition, WTT features many of the world’s best players competing annually for the King Trophy, the league’s championship trophy named after King. In July 2015, WTT became the fifth major professional team sports league in the U.S. to reach the 40th season milestone. In 2017, team owners Mark Ein and Fred Luddy acquired majority ownership of the organization. The 43rd season of WTT presented by GEICO begins July 15 and concludes with the WTT Finals on August 5. On the recreational side of the sport, WTT Community Tennis operates team leagues and events, providing grassroots programming throughout the year. For more information, visit www.WTT.com. PreviousPrevious post:THE GWQA WITH FIDAN BAGIROVA: THE IT GIRL AS CONCEPTUAL ARTISTNextNext post:SIPSMITH LONDON DRY GIN BRINGS 100 MARTINI EXPERIENCE TO NYC!